Stock picking is a difficult art, which is why eight out of 10 actively managed large-cap funds failed to beat their benchmarks over the past decade. Holding more of these stocks would have made their numbers look a lot better. Over the last five years, the biggest trend among retail investors has been a shift toward passive investments. Last year, Bank of America Merrill Lynch noted passive funds had grown from 20% of long-only assets under management four years ago to a 33% market share through August 2015. Bank of America's report also noted cumulative fund flows into passive investments dwarfed active investment flows, suggesting the growth of passive vehicles came at the expense of active ones. Morningstar's data supports a further shift away from active management; the investment research firm reported 40% of all U.S. equity fund assets and 25% of U.S. fixed-income assets were passively managed as of April 2016. The motivation for this shift toward passive funds is that many investing managers are underperforming the benchmarks, and charging higher fees as well. S&P Dow Jones Index reported 82% of all actively managed large-cap managers underperformed their benchmarks over the last decade. It's likely some of the remaining 18% of fund managers loaded up on the following companies, which outperformed the Dow Jones Industrial by a significant margin. It goes without saying the highest-profile stock gainer in the Dow over the last decade has been Apple (NASDAQ:AAPL). Building upon the success of its iPod, former CEO Steve Jobs introduced the iPhone at an event in early 2007 with the promise to "reinvent the phone." He wasn't lying: The iPhone has become an iconic consumer electronics device, and now makes up approximately two-thirds of Apple's top line. If you'd had purchased shares of the company 10 years ago, you'd be sitting on gains of nearly 1,300%, good for annualized gains of approximately 105%. Compare this to the overall Dow Jones Industrial Average, which averaged approximately 75% for the entire decade. The last year hasn't been nearly as kind to Apple: The stock is down 22%, as many experts worry that the supercycle that led to the iPhone may be over, with no game-changing new products in the pipeline for the immediate future. The next two overperformers don't operate in the high-flying technology space. In fact, their industries -- footwear/apparel and specialty retailing -- can appear rather boring. However, over the last decade, Nike (NYSE:NKE) and Home Depot (NYSE:HD) have provided investors with returns of 500% and 300%, respectively. Their successes were not based on new or novel ideas; they simply executed better than competitors and created a cult-like followings among consumers. Nike has doubled both its revenue -- from $15 billion in fiscal 2006 to $31 billion last year -- and net income -- from $1.4 billion to $3.3 billion. Additionally, Nike has had three separate 2-for-1 stock splits, meaning one share 10 years ago has become eight shares today. Nike essentially consolidated the athletic footwear market by buying Converse, and capitalizing on missteps by Reebok and Adidas. However, it may have serious a new competitor with Under Armour's entry into the footwear market. Home Depot may be a shocking inclusion on this list, considering the past decade has been defined by the peak of a huge housing bubble and a subsequent real estate crash. Its 300% stock return has been much less due to growth and more due to increased operational efficiency and a robust share buyback program. Fiscal 2006 may be a poor point of comparison for Home Depot due to the aforementioned housing bubble, but the company only increased its top line 8% during this period.It did, however, double its earnings per share due to those share buybacks and improved margins. Home Depot has decreased its diluted weighted average common share count by a mind-boggling 40% in the last decade. It appears the last decade was a great time to be an active manager if your goal was to outperform the Dow Jones Industrial Average. By my count, 18 of the current 30 stocks, or 60%, on the Dow Jones Industrial average have outperformed the index over the last decade. 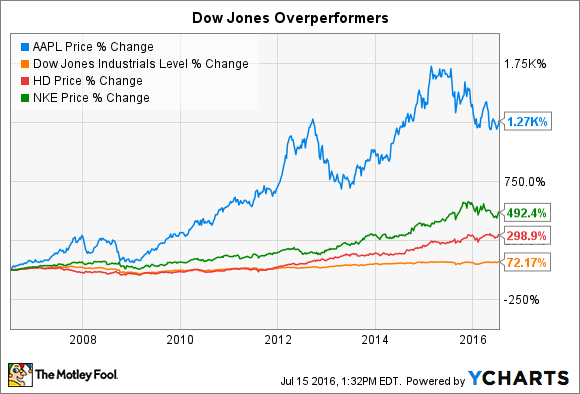 The Dow Jones Industrial Average is a price-weighted index where high price-per-share stocks that have lagged the index for the last decade, like Goldman Sachs and ExxonMobil, have an outsized effect on the index's performance. Personally, I believe individual investors have advantages that fund managers are not afforded. Specifically, retail investors are unburdened from the "tyranny of the calendar," while a fund manager has to worry about fund redemptions if the index underperforms. This mindset allows investors to find long-term investments that will produce gains for decades rather than worrying about the next quarter's earnings report.